Knees - William Jay Bryan, M.D. Nothing beats experience and Dr. Bryan has years of joint replacement expertise. Dr. Bryan performs hundreds of total and partial knee replacements every year. Advances in technology have dramatically improved the joint replacement landscape. Dr. Bryan remains at the forefront of surgical technology, using the best products to ensure his patients receive the highest quality care available. Dr. Bryan has incorporated the use of demand matching premium products from Biomet for every patient. Dr. Bryan uses the Biomet Vanguard. 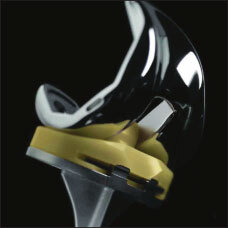 The Biomet Oxford Mobile Bearing Unicompartmental System is his choice for partial knee replacements. Dr. Bryan is one of a few select American surgeons who were trained in Oxford, England at the introduction of the unique Oxford knee in the United States.